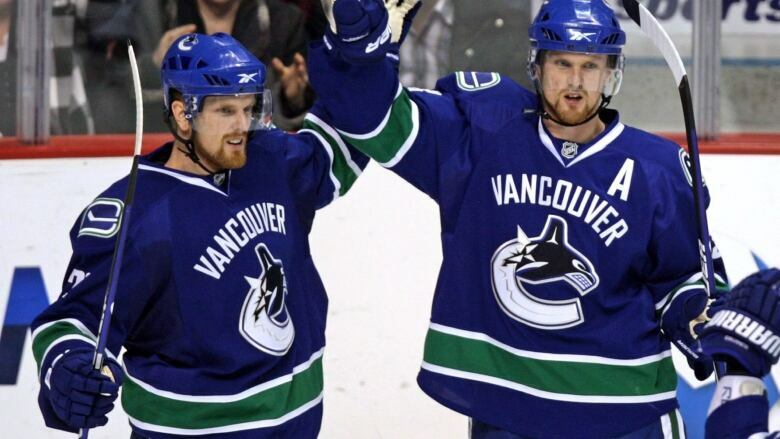 Henrik and Daniel Sedin will dress for their final game at Rogers Arena when the Vancouver Canucks play the Arizona Coyotes Thursday night. It's a game that means nothing in the standings, but will have the emotional pull of a Stanley Cup final. Henrik and Daniel Sedin will dress for their final game at Rogers Arena when the Vancouver Canucks play the Arizona Coyotes Thursday night. Vancouver and Arizona both failed to qualify for the NHL playoffs, but a boisterous, sold-out crowd is expected to attend the game to say goodbye to the Swedish twins after 17 seasons wearing a Canuck jersey. "I think that's when you realize you're probably taking your last steps on the ice," Daniel said after an optional practice Wednesday. "It will be special." The 37-year-old brothers from Ornskoldsvik, Sweden, announced Monday they are retiring at the end of the season. Their final game will be Saturday in Edmonton against the Oilers. The Sedins' parents and two brothers will attend Thursday's game. Team officials say there will be video tributes but no official presentation. That will wait until when the brothers have their numbers officially retired. Upper bowl tickets for the game were selling for between $165 US and $175 Wednesday on StubHub. "It's not something we are looking for," Daniel said about the final home game. "It's a chance to thank our fans. "Time flies. It will be over before you know it. We're going to enjoy it, treat it as a normal game." The Sedins got a taste of what to expect during Tuesday night's 5-4 shootout loss to the Vegas Golden Knights. 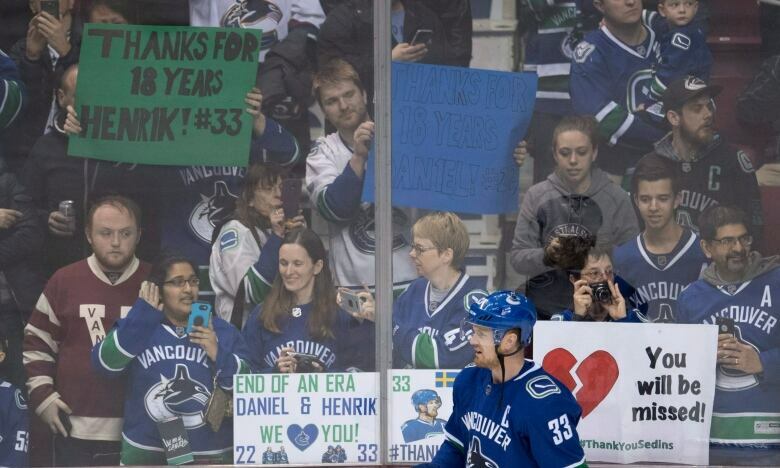 Prior to the game fans lined the boards, waving signs thanking the Sedins and holding jerseys. There were video tributes on the big screen. The crowd gave standing ovations before, during and after the game. Centre Bo Horvat, who many expect to replace Henrik as the Canucks' captain next year, said everyone in the dressing felt the emotion. "It's the end of an era," said Horvat. "It's the end of an amazing career for those guys. "To be part of it is really special for me." Head coach Travis Green said the Sedins were "old school" in their professional approach to the game both on and off the ice. "They have been a joy to coach, something I will cherish," said Green. Horvat will miss the attitude the brothers brought to the rink each day. "Watching them play is one thing but [it's] them being around the room," he said. "They are always happy to be here. I've never seen them have a bad day or not have a smile on their faces. "That's what I'm going to miss most." The Sedins have become the face of the Canucks since being drafted second and third overall in 1997. Even as they lost a step on the ice they were respected for their community work and easy relationship with the media. Back in 2010 the brothers donated $1.5 million to help build a new BC Children's Hospital. They also established The Sedin Family Foundation which works to improve healthy, education and family wellness in B.C. With the Canucks struggling on the ice this season — Vancouver heads into Wednesday night ranked 27th in the league with a 30-40-10 record — there have been plenty of vacant seats at Rogers Arena and the building has often been low energy. The excitement and enthusiasm generated against the Golden Knights were reminders of a time when the Sedins led a Canuck team that won back-to-back Presidents Trophies and lost Game 7 of the 2011 Stanley Cup final to the Boston Bruins. "It was fun," Henrik said about the passion in the building. "It was like going back six or seven years. "It was good to get a game where the crowd was really into it like they were." Henrik, known primarily as a setup man who would rather pass than shoot, won the Art Ross Trophy as the league's top scorer in 2009-10, with 112 points. He also won the Hart Trophy as league MVP. Daniel, the triggerman, won the Art Ross in 2010-11 with 104 points. He won the Ted Lindsay Award as the league MVP voted on by the players. The Sedins are second and third in team scoring this year. In 79 games Daniel has 21 goals and 32 assists for 53 points, two less than injured rookie Brock Boeser. Henrik has three goals and 45 assists for 48 points in 80 games. Daniel knows emotions will be ratcheted for the final home game. "Yesterday was special," he said. "Tomorrow will be special too."